Alexandre Rodrigues da Silva (born 2 September 1989), commonly known as Alexandre Pato or simply Pato, is a Brazilian professional footballer who plays as a striker for Milan and the Brazilian national team. His nickname, Pato, refers to his place of birth, Pato Branco. The literal translation of Pato from Portuguese to English is "Duck" which has evolved into a common nickname for him. In June 2006, at only 16 years of age, Pato was signed by Sport Club Internacional to compete in the Campeonato Brasileiro Sub-20. Despite the fact that he was competing against players up to four years older than he was, Pato became top scorer of the competition as Internacional Sub-20 defeated Grêmio 4–0. Ready to join the Inter first team in November that same year, his debut finally happened at the Estádio Palestra Itália against São Paulo giants Palmeiras for the Campeonato Brasileiro. Alexandre Pato met and surpassed any and all expectations of what was expected of him as he scored his first professional goal within the first minute of the game. The rest of his participation was spent dribbling and confusing defenders as he made two assists (and almost scoring another himself) to help Internacional rout Palmeiras 4–1. He was substituted off in the 77th minute. Pato was included in the Internacional squad that won the 2006 FIFA Club World Cup. During this event, Pato broke Pelé's long standing record as he became the youngest ever player to score in a FIFA organised competition at the age of 17 years and 102 days old against African club champions Al-Ahly. Pelé was 17 years and 239 days old when he scored against Wales during the 1958 FIFA World Cup. Keeping up with his promising figure, Pato debuted at the Campeonato Gaúcho on February 24 against Veranópolis and scored a goal in the 2–1 victory. He also debuted in Copa Libertadores on 28 February against Emelec of Ecuador (also his first game at Beira-Rio) and scored once during the 3–0 thumping. But the biggest highlight of Pato's time with Internacional was during the Recopa Sudamericana as he helped Internacional win their first ever title. Against Pachuca of Mexico, he scored one goal in the 2–1 defeat in Mexico. But on the return game on June 7 and with more than fifty-one thousand Colorados present, Pato had a great performance as he scored once and led the 4–0 thrashing to win Internacional's third international title. Incumbent European champions AC Milan officially confirmed the signing of Pato on 2 August 2007, paying nearly €24 million to transfer his contract from Internacional. Due to FIFA football regulations regarding non-EU minors, Pato was unable to play official matches for Milan until 3 January 2008, when the Italian transfer window and registration reopened. However, Milan was allowed to include the player in friendlies and training beginning 3 September 2007, one day after his 18th birthday. Pato made his non-competitive debut in a 2–2 draw against Dynamo Kiev on 7 September 2007 and scored a header. On 4 January 2008, Pato's transfer to Milan became official. Pato scored his first Milan goal on his Serie A debut against Napoli in a 5–2 home victory on 13 January 2008. He scored his first brace for Milan, in a 2–0 victory over Genoa at the San Siro on 27 January 2008. He finished the 2007–08 season with 9 goals in 20 appearances (18 in the league). In late 2008, Pato scored two goals in Milan's 5–1 win over Udinese just before the Christmas break, and managed to shine again with a brace against Roma the following matchday at the Stadio Olimpico on 11 January 2009, proving that he is a vital part of Milan's attack. He continued his impressive form for Milan, hitting six goals in four games, including a game winning strike against Fiorentina on 18 January. On 15 February, he scored his 11th goal of the season in a 2–1 defeat against home rivals Internazionale. On 26 February, Pato scored his 12th goal of the season against Werder Bremen in the UEFA Cup, a game Milan drew 2–2; but with this, were knocked out the competition on the away goals rule. Pato continued his good form with two goals against Siena on 15 March. Pato finished the 2008–09 season as Milan's top goalscorer with 18 goals. On 22 August 2009, in the first Serie A match of the 2009/2010 season, Pato scored a goal in each half during the 2–1 win against Siena. Around two months later, on 21 October 2009, during matchday 3 of the Champions league group stage, Pato scored 2 second half goals in a 3–2 win against Real Madrid at the Bernabéu. He has since played at the right wing in a 4–3–3 formation. On 18 January 2010, Pato was awarded the 2009 Serie A Young Footballer of the Year award at the Oscar del Calcio ceremony becoming the first Brazilian to be awarded with the title. On his return to the team from injury, Pato scored a goal in each of Milan's next three games against Udinese, Bari, and Fiorentina. On 28 February, he scored a brace in the first half at the San Siro, helping Milan beat Atalanta 3–1 but coming off halfway through the second half due to a hamstring injury. This injury forced him to miss two crucial trips to Roma and Manchester United. To conclude Pato's season, he injured the same muscle again shortly after returning and was forced to miss the rest of the season, playing only 20 games due to constant injuries. In the first match of the season against Lecce, he scored 2 goals in Milan's 4–0 win. However, he found himself on the treatment table just after his first 2 matches of the season which ruled him out for the next 3 matches. In his next full match after his injury, he scored twice against Chievo at the San Siro, returning to his position as a striker in a 4–3–1–2 formation. He then scored once again against Bari in San Nicola. After a string of great performances, Pato injured his hamstring for the third time in less than a year. This injury ruled him out for six weeks. On 9 January, he scored his first two goals of 2011 to help Milan draw 4–4 against Udinese after going down 3–1. On 26 January, he scored two goals helping Milan to win 2–1 against Sampdoria in Coppa Italia. On February 6 he scored a goal against Genoa helping Milan to draw 1–1. Another remarkable goal of his came on 20 February when he scored the winning goal in a 2–1 away victory over Chievo, when he dribbled in between two defenders and finished off with a goal off the post. He scored the third goal after assisting Boateng in a 3–0 victory over Napoli on 28 February. With Ibrahimovic suspended for the Milan derby Pato's two goals saw Milan secure their much needed 3 points. He dedicated his brace to his supporters. Assisted by Boateng, he scored the second goal in a 2–1 away win against Fiorentina on 10 April. On September 13, in a Champions League group-stage match against Barcelona, Pato scored the 5th fastest goal in the competition's history, 24 seconds after kick-off. Later that month, he suffered a thigh injury during a 1–1 draw with Udinese. Pato made his return as a sub against Fiorentina and hit the post in the 79th minute in a 0-0 draw. He then scored and won a penalty in a 4-0 win against Chievo and in midweek scored against Viktoria Plzen and setup Robinho in a 2-2 draw. He started against Bologna the next week in a 2-2 draw. In January 2012, Pato was on the brink of moving to the Ligue 1 side Paris Saint-Germain F.C.. This move would have given AC Milan the opportunity to make a bid for Carlos Tevez. However on the 12th January 2012 Pato refused the transfer citing his commitment for the rossoneri. During the Coppa Italia round of 16 victory over Novara, Pato picked up a muscle strain in his thigh, which tests revealed an injury of his biceps femoris of his left thigh. After gaining prominence at club level, Pato was called up for the youth teams of Brazil. He helped Brazil win the 2007 South American Youth Championship, which qualified the country for the 2007 FIFA U-20 World Cup, and was selected by Brazil coach Dunga for the 2008 Summer Olympics. He scored his first goal for the senior Brazilian team on his debut against Sweden at the Emirates Stadium in England on 26 March 2008, beating Pelé's record of scoring a goal within seconds of his full international debut. He took part at the 2009 Confederations Cup in South Africa, where he played only in the first round match against Egypt. Then, he was not called by Dunga to play in the 2010 World Cup. He became a regular under new coach Mano Menezes, wearing the number 9 jersey. He scored a goal in Brazil's 2–0 friendly win over the United States on 10 August 2010. He scored the second goal in Brazil's 3–0 win against Iran on 7 October 2010. 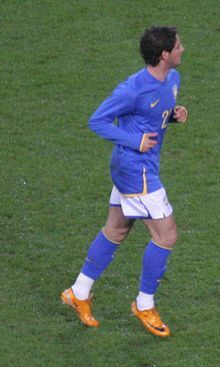 Pato's success in the Brazil national team continued as he again scored in a friendly match against Ukraine where they won 2–0. Pato has so far participated in the 2011 Copa América and has scored a notable brace in the group stage against Ecuador. Pato said in an interview with the Brazilian television program, Esporte Espetacular that at age 11, he broke his arm and while examining the injuries, doctors found a tumour in the arm and feared the arm needed to be amputated. A successful operation removed the tumour. In 2007, Pato was engaged to Brazilian actress Sthefany Brito. They mutually split up in January 2009 due to their inability to keep a long-distance relationship. However, they got back together, and on 7 July 2009, they married in a ceremony at the Copacabana Palace in Rio de Janeiro. However, the marriage lasted less than ten months, and the couple divorced on 21 April 2010, with Brito citing Pato's constant partying as the reason for their split. In 2010, he had a brief romance with Miss Brazil 2010, Débora Lyra. In 2011, Pato has been linked as being in a romance with Barbara Berlusconi, daughter of Silvio Berlusconi.